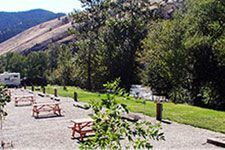 Wagonhammer RV Park & Campground is a full facility "Destination Park" on the Salmon River, located at mile marker 324, Highway 93 North just 2 miles south of North Fork and 18 miles north of Salmon. Our "Big Rig Friendly" Park also invites tenters & bikers with tipis on site. We offer free WiFi, 50 amp service, showers. laundry mat, horse facilities & a very unique Gift Shop. Family gatherings are welcome. We are your headquarters for rafting, fishing, hunting & horseback riding!